Hello! This is Kaz. Thanks for visiting this website. Last update: April 7th, 2017. Rowan, 23 kyu player, who took 8 lessons from me and is now 13 kyu. Fred, 19kyu player, who took 3 lessons from me and is now 15 kyu. Marek, 8 kyu player, who took 7 lessons from me and is now 5 kyu. George in his 60s has been taking my offline Special Services Lessons, beginning in summer, 2014, and has improved quickly. See George to learn how he has studied. Question: I notice that you don’t play in tournaments anymore, either in Japan or abroad. Why is that? Question: You seem to emphasize basic joseki in your lessons. Does that mean that I will never get to learn the josekis that top pros use? Question: How did you develop your teaching style? Question: I’ve never heard of any Go teacher teaching common amateur mistakes and how to fix them. Why is that? Question: What if I say I need only your commentary and not the problems. Would you lower your teaching rate? Question: How often do your students take lessons? Question: In your teaching you say “$ 30 mistake” and “$40 mistake”. What are those? Question: I have seen you teach Romeo-and-Juliet shape, Indiana Jones tesuji on KGS plus. What are those? Question: Are you critical of your students? When you teach, do you encourage or discourage your students? I notice that you don’t play in tournaments anymore, either in Japan or abroad. Why is that? That’s correct; I don’t play tournaments any more. In fact, I even stopped studying solely to improve my own playing many years ago. Here’s why: At one point I realized that in order to teach my adult players (both dan- and kyu-level) to the best of my ability, I would have to put in a lot of time studying and analyzing hundreds of games. Unfortunately, though, even that undertaking would not be satisfactory. You see, in order to teach players of varying levels most effectively, I would have to spend time studying many games at each of the different levels. Dan-level players need to be taught differently than 5-kyu players, who need to be taught differently than 20-kyu players, and so on. Obviously, that represents a huge commitment. So I realized that I would have to make a choice between analyzing those amateur games or studying for myself. Studying for a major event- the World Amateur Championship, for example- requires 3-4 hours per day of study, with 8 hours on the weekends, for perhaps many years. I could not both prepare myself for tournaments and give my students the quality instruction they expect and deserve. I, on the other hand, examine and teach amateur games at least 8 hours a day, often 12 hours or more, at least 5 days a week, possibly 7 days a week. I’ve been doing that for more than 15 years. Naturally I have accumulated hundreds of common adult mistakes as well as the knowledge of how to fix them and how to teach adults. When I prepare lessons for my students, I sometimes spend the whole day considering their games: their weaknesses, tendencies and habits, as well as the most effective way to present the material. Only then do I start creating the problems for the lesson. Incidentally, I should say that I do look at top pros’ games enough to familiarize myself with the latest joseki, opening, etc., but I don’t spend anymore time than that. You seem to emphasize basic joseki in your lessons. Does that mean that I will never get to learn josekis that top pros use? I do indeed teach pro-level joseki- but mostly those pro joseki that are simple, short, basic, and easily understood, so even adult amateurs can learn them easily. More importantly, the joseki that I teach are relevant to a broad range of situations that come up in real games, so my students will have plenty of chances to use them. And because my students use them frequently, the joseki and the ideas behind them are integrated into the student’s personal repertoire of moves sooner- at which point the student can effectively use them without thinking. I have had occasion in the past to prepare examples of pros using joseki in their games, but pros often play “top pro level advanced tesujis” that are particular to the game at hand, and are not good basic moves that can be used in many situations. Or they choose joseki that are 30-40 moves long and contain dozens of variations. Children are capable of memorizing these, but not adults. I know this from my own teaching experience- adults cannot memorize long, complicated joseki. Adults need to focus instead on the meaning behind the moves. Despite what I just said above, this method of learning is, in fact, also appropriate for children. When I was a child, I was told to memorize various joseki as well as professional games- which I did without understanding the reasons behind the moves. It wasn’t until I reached 6-dan that I began to understand the meaning of the moves, and I was then able to distinguish between moves that are broadly useful, and those that are not. Looking back I wish I could have been taught the meanings of the moves in the first place; I would have learned faster and been a sharper player. At one point, I attended Ryokusei Go Gakuen, a Go school where Yamashita Keigo 9 dan pro studied. One day my Go teacher began using Go problems in his lessons with me and the other students. We found the tesuji problems much easier to understand than joseki, because the reasons behind tesuji moves are more immediately apparent; it’s also easier to see how a tesuji can be used in different situations. So you see, pure memorization is not necessarily efficient and effective for children, either. In my lessons, I use dozens of problems to show how you can use the ideas behind them in your games, and I also teach when you shouldn’t use them. Since I can present dozens of problems to prove this, you will be able to learn them efficiently and effectively. Kaz stresses teaching basic shape. He then applies these shapes to many situations so that these shapes become like second nature. He will give problems that focus on a certain shape from different angles that will make you think but will also drill through repetition. I find that this repetition really helps me remember which I can then apply to a game situation. My goal is to have you play basics until they become second nature for you. Consequently, when it comes to joseki, I teach simple, basic, easy-to-understand joseki variations which contain good, basic shape and tesuji- things that can be applied to other situations often. And you will still find them useful even if you get to top amateurs. I teach good shape in the same way. However, when it comes to tesuji, life-and-death, middle-game fighting, you can’t be expected to do what top pros do- they can read ahead more than a hundred moves in a flash. Further, they know thousands of complicated tesuji and tsumego. Imagine: if an adult amateur wants to copy a pro-level middle game move, she will have to be able to read at least 30- 40 moves ahead (with variations! ), and confirm whether they’ve made the right move before playing- but that’s obviously impossible. Many adults have a hard time reading 10 moves, let alone 30-40! I remember having taught the “two-stone edge squeeze” to a student. But this tesuji requires reading ahead many moves. At that time I was an inexperienced Go teacher and didn’t know how difficult it was for my student to read that far ahead. Then he tried that tesuji in his game without confirming the reading; he lost his whole group! When it comes to tesuji, life-and-death, and middle-game- things that require a lot of accurate, complicated reading- adult amateurs have to learn at their own level, and build a foundation one block at a time. I teach the situations that come up in amateur games most frequently, so my students can have useful tools they will use often and with confidence. However, despite my popularity at the time, I have to say that my teaching is even better now, because at that time, I didn’t know very much about common amateur mistakes- since then I have analyzed and catalogued hundreds of common amateur mistakes, and how to fix them. I remember being impressed by an article in a business magazine about how important it is to listen to a customer’s voice in order to provide better service. I then modified my teaching style to better address the needs and demands of my students. This sometimes requires reading between the lines, as often a student may be a bit shy about making demands of hijs/her sensei. In other cases, they may not even know what they don’t know. Then I have to listen really carefully and probe their understanding with problems to find out what they need. To me, listening is crucial when it comes to teaching. As a result, their feedback and suggestions improved my teaching significantly. This is one of the biggest reasons that my private teaching today is completely different from that of other Go teachers. My teaching has developed and evolved as a result of listening to the needs and requests of my students. My teaching continues to improve all the time. I still read business magazines every week, and whenever I learn something from a successful company, I try to incorporate it into my teaching. For example, the other day I learned about how Disneyland Tokyo has been a great success for more than 30 years. And so, I’ve applied their very successful method to my teaching. As long as I can keep learning from my students and successful companies, I’m confident that I will always be able to provide the best Go teaching service possible. When I teach Japanese players, I always give problems along with a game record and a commentary. Even when I did 17 simuls every week, I managed to keep doing that. (Soon many of them started recording their games by themselves. I was lucky.) If you take a lesson in Japan, you will find that no Go teachers offer a game record or a commentary. Nor do they give you any problems after the lesson. I was probably the first Go teacher to start that in Japan, and I still do that. I do that because unless adult students review their lessons, they will not learn from them. Children can remember all the commentaries and variations after a game with a Go teacher or a pro and retain them for many years without recording them. However, my teaching experience tell me that adults cannot remember them. This is why I record all the games, write commentaries, and give problems. (When I was doing a 17 simuls every week, I taught more than 50 adult players in total, mostly retirees, every week at a Go school, and recorded more than 30 games. During that time, I began to see various common amateur mistakes. Then I started thinking how to correct the mistakes. I did that for 5 years. Moreover, I always reviewed my teaching after I left the Go school. I could remember games, a lesson, a lecture at least at least for a week, sometimes years. And since I could review them in my head, I reviewed on a train, during dinner, or in bed. I could also think of making problems while walking down the street. After that, I stopped teaching at the Go school and began teaching privately. About 95% of my students were students I already knew from the Go school. So they continued taking my lessons after I started private teaching. During the time I taught in the Go school and privately, I invented various new teaching styles. Teaching online is much harder than face-to-face- partly because I can neither see my students faces nor communicate with them easily. But I have developed a way to compensate for those difficulties. So I’m confident that my online and offline teaching is as good as my face-to-face teaching now. A lot of my teaching techniques are incorporated into my problems. Consequently, the more you solve my problems, the more you will understand how different my problems are from any other problems published in books or on websites. In Japan there is a famous Go teacher who has been on TV for many years. He was very famous even before I started teaching. In March, 2014, he showed a new way of teaching on TV, but I had already been teaching like that for more than 10 years. Since then, I’ve evolved that teaching style and tried many other different ways of teaching. I don’t use everything because some methods were not effective. Today I’m still learning common amateur mistakes. When I see an amateur game, I can spot dozens of common amateur mistakes without thinking, and I can make many problems to correct them, according to each student’s level. I feel that listening to my students and reviewing my lessons are two of the most important ways to improve my teaching. First I’d like to say that I teach not only common amateur mistakes and how to fix them, but I also teach basics that is the most important thing in order to be a strong player. Over the years I’ve learned that one of the best ways for adult amateurs to get strong is to get basics because many of them lack a lot of basics. Worse, many of they keep learning new things before they learn basics. Further, many of them keep making common amateur mistakes that deviate from basics. In order for them to learn basics as quickly as possible, they have to learn basics as well as to learn how to correct their common amateur mistakes. After they correct their mistake, they are playing basic moves. These are the biggest reasons that I teach them common amateur mistakes and how to fix them. Over the years, I’ve had a great passion to help Go players, especially adults and especially kyu players strong. In order to achieve that, I had to observe, examine, and analyze hundreds of their games and their mistakes. It took me at least 3 or 4 years to make myself familiarize their mistakes. It took me more years to learn how to make problems to fix their bad habits. In fact I’m still learning their mistakes and how to make better problems to fix their bad habits every day. It seems endless. But someone has to do it. So I’m still working hard to make more problems every day. By the way, there is a great difference between children and adults. Children can learn basics quickly. Their teachers also teach top pros’ games. So children naturally became interested in top pros’ games. But when I listen to many adult players in Japan and in America, adults are interested in getting strong themselves. They know very few pros’ names, and many of them don’t really pay attention to pros’ games. They are too busy with work, family, etc., and simply don’t have the time to learn about pros’ world. They don’t even have time to study Go for themselves. They are interested in becoming strong, and they pay money for a Go lesson to get strong, not to learn top pros’ games or the latest opening or the latest josekis. Incidentally, I think of my teaching as “doctor’s diagnosis Go teaching”. When you have a headache, you go see a doctor, and he or she will listen to you attentively to find out what causes a headache. The doctor will also examine you by computed tomographic scan. I examine my students by listening to how they have studied so far, how they play a game, what problems they have had. I will also examine their latest 10 games and see what problems they have. I try to understand their Go through various angles. Then I will comment on a game and choose or make problems most suitable for them based on my diagnosis. What if I say I need only your commentary and not the problems. Would you lower your teaching rate? I send problems in order to help my students learn most efficiently and most effectively, and they will be learning my lessons systematically. Without sending my problems, my students would not learn most efficiently and most effectively. Let me elaborate on this further. I used to teach without giving any problems. But this teaching was not very effective at all. Let me tell you the reason. Go is so complex and broad that every time you play a game, you will almost always face new situations, new fights, new shapes, and new tesuji in each game. Every time I teach my adult students, in every game, many new things come up. Sometimes the same shape or tesuji would come up, but that would happen only once in every 5 or 6 games. So, my students were in a teaching situation in which they were constantly trying to learn new things. But the more I taught, the more I became skeptical of the effectiveness of this method, because my students weren’t improving, nor were they remembering anything I’d taught them. And who could blame them? If I teach you a joseki that will come up in your games only once or twice a year, how can you possibly remember it? After some years, I was convinced that this way of teaching would never be a systematic, easy way for adults to learn things- not to mention retain what they’d learned. I began to explore new ways of teaching, trying various out-of-the box teaching methods. After many years, I’ve learned that adults need a systematic way of learning Go, rather than learning everything unsystematically and randomly. For example, when I decide to teach adults a certain tesuji, I try to choose from those tesuji that come up most frequently in actual games. And I try to present that tesuji in different situations. That way, adults understand it from different angles in various situations. 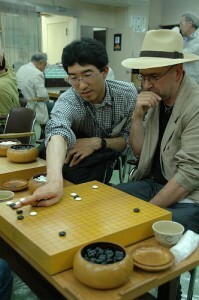 A teacher using the proper method cannot do this standing over the goban after a simul; there’s not enough time, and the student will not retain the material. That’s where my problems come in. I send various custom-designed problems after each lesson. The more tesuji problems my students solve, the more deeply they understand that particular tesuji- why it works, when it will arise, and when the tesuji is not suited to the situation on the board. Only then will they be able to use the tesuji in their games. Only then, will they retain it for a long period of time. This is what I mean by teaching systematically. This is the biggest reason that I send custom-designed problems. This is how adults can learn my lessons most effectively and most efficiently. In addition, I often make problems to explain tesuji, opening, shape, or difficult concepts such as the “Romeo-and-Juliet” shape. In a game commentary, the comments and diagrams I can make are very limited. So I make many problems to explain these hard concepts. The more problems I make, the more easily my students will grasp the concepts. Generally when I present 20 or 25 problems, my students have a pretty good understanding of any topic or concept. It varies. Some of my students are retired, so they have enough time to study and review my lessons, and so they take one lesson a week. Others may not be retired, but they are really addicted to my teaching, and also manage to take a lesson every week. And then there are students who may be very busy and take a lesson only once a month, and that’s fine as well. I think it really depends on how much time you have to review my comments and texts. If you don’t have time to review them by the time you think you should have another lesson, you may want to wait. Take your time to review the material thoroughly at least a couple of times if not more, and then taken another lesson. The key to getting stronger is how often you review lessons, tesuji, life-and-death, and the other problems relating to your mistakes. Many adults review lessons once or twice and never review them again. But that’s not good enough- you should review them many times. The more, the better. If you’re too busy, please try to review them at least once a month. Continuity of study over a long period is another key to getting stronger. It takes time to become strong. There is no such thing as an overnight success. So you shouldn’t rush. Some adults find they have to stop studying Go because they get busy with work, family, etc. However, even if you stop playing and come back to it a year later, you can often get your skills back quickly if you have built a strong foundation based on lots of review of your lesson material. So this is another big reason why I emphasize reviewing. Having said that, I recommend that you take one lesson first and see how you like it, and notice how long it takes you to review my problems. Then you will have an idea of how often you should take lessons. Question: You often use expressions like, “$30 mistake” and “$40 mistake”. What does that mean? When I was a less-experienced Go teacher, I often saw many mistakes in my students’ games. After many years of teaching adult players, however, one day I came to the realization that many of the amateur mistakes I saw are actually very, very minor mistakes. What I mean is, a 10-kyu player can’t be expected to play a 5-dan move. If a 10-kyu player plays a 5-kyu move, well then, that’s really wonderful. And if he/she plays an 8-kyu move, that’s something to be proud of as well. $100 mistake = An instant loss. To be avoided at all costs! $ 90 mistake = Excruciatingly bad. $ 80 mistake = Excessively bad- so bad that you may not forget it for a week. $ 10 mistake = A minor mistake; not so important for kyu-level players. $ 5 mistake = A small mistake; who cares? I’m going to show an example of Romeo-and-Juliet shape and an Indiana Jones tesuji on my website soon. ‘Romeo-and-Juliet shape’ refers to a ripped-through shape. I’ve named that ‘Romeo-and-Juliet shape’ because I wanted to make a memorable name to describe how horrible this shape is. Many adults, including 3dan and 4 dan players who haven’t built the strong basic foundations, play this shape freely in their games. I tried to elaborate on how horrible the shape was, but many of them didn’t seem to understand the gravity of the mistakes. This is why I decided to make a memorable name. ‘Romeo-and-Juliet shape’ is one of the most important concepts in order to become a real real strong player, but it’s one of the hardest to grasp it, especially for adults. One of the biggest reasons, I think, is that there are no Go books about Romeo-and-Juliet shape in Japan. Children can learn it fairly easily. Pros learned it when there were little, so they have been avoiding the shape without thinking since they were little. But it’s really hard for adults, especially those adults who started learning Go in their mid 30s or older. In order to help those adults understand the shape and the concept, I have made more than two hundred original problems. You don’t have to study them all. But the more you solve the problems, the better your understanding will be. ‘Indiana Jones tesuji’ is a connecting tesuji. I wanted to make a memorable name, because ‘Indy tesuji’ is one of the most basic and versatile tesujis. In many cases, this tesuji is often rather easy for amateurs to learn. (Yet, so many people, including dans, do not see this because they’ve never trained in it.) Moreover, you can apply the ‘Indy tesuji’ to the corner, side, and even the center. Most tesuji cannot apply to all these three places. I always highly recommend the Indiana Jones tesuji, because it comes up at least once in every amateur game. I have hundreds of Indiana Jones tesuji problems. If you solve about 30 problems, you will have a good understanding and can apply it in your games. Of course, the more you solve the problems, the better you can get. I’ve also made ‘Rear Window’ intrusion problems and ‘Godzilla-defeating tesuji’ problems. I have come up with those names because they are all from American movies. And there is a reason for that. I once read a business book, which states that if you know American movies,　soccer, and wine, then you should be able to make friends with anyone in any countries in the world because these three things are probably the most common and popular things all over the world. Since I love American movies, I tend to use the titles of the movies. I also would like to make people enjoy learning Go. Then I first thought Romeo-and-Juliet shape would be a nice name for that. I’ve also named other things such as ‘onion tesuji’. ‘Onino tesuji’ makes the enemy’s’ eyes ‘water’ just like chopping onion. Are you critical of your students? When you teach, do you encourage or discourage your students? I believe that when it comes to teaching, encouragement and constructive advice are far better than discouragement and criticizing students. I strongly believe that because of my past experiences. When I was an insei (Go apprentice), my Go teacher was extremely critical of my moves. He became more and more critical every week and started treating all my moves horrible and terrible and became angry. At that time I tried to study more than 10 hours, often 15 hours. Despite my efforts, my teacher’s criticism escalated. The more he criticized my moves, the more I lost my confidence. Worse, he also started criticizing my personality, things I said, and things I acted, and even my parents. His verbal abuses continued for a year and a half. At the end, I lost all my confidence in my Go and as a person, lost the insei tournament, and quit. Japanese people tend to be harsh and very discouraging. Americans, on the other hand, tend to be encouraging. When I went to school in America, I met many American Go players, and they were all very nice and kind to me. I was also very surprised that teachers in school were very encouraging, and I learned a lot in terms of education and how to encourage people. In my experience, encouragement is far better than discouragement. I believe that discouragement would not do any good for anyone. Also see Teaching, Offline lessons, Online lessons. © 2019 KazSensei. All Rights Reserved.